We will notify finalists soon. Winners announced at the 2019 School’s Out, Make It Count Conference on Oct 19th – see you there. 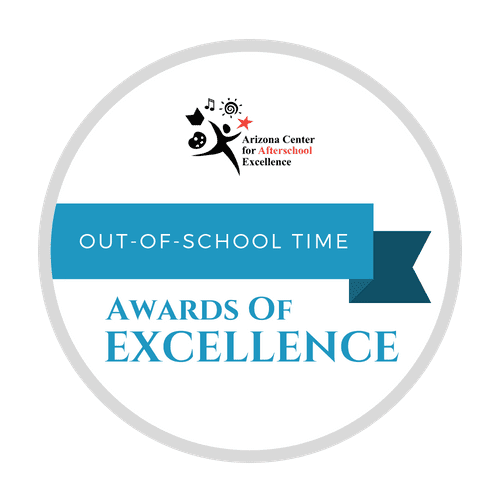 The Annual Arizona Out-of-School Time Awards of Excellence recognizes excellent out-of-school time programs and staff members for their exemplary work in providing and promoting quality youth development programs for Arizona’s youth. For the 18th consecutive year, the Arizona Center for Afterschool Excellence will honor winners in five categories (see detailed descriptions below). Winners will be announced at the School’s Out, Make it Count Conference on October 19th, 2019. The nomination application and any additional materials must be submitted online at azafterschool.org. Judging will occur in two rounds. The first round will produce finalists for each award. All award finalists will be selected by an independent panel of judges. Once finalists have been selected additional letters of support from colleagues, parents and students, copies of relevant supporting documents, including: pictures, articles or other commendations, or recognition your program will be collected for the second round of judging. Finalists and their nominators will be notified by email. The winner and honorees will be announced and awards presented at the Arizona Statewide Out-of-School Time Conference, October 19, 2019. All finalists are to attend the annual conference. By submitting a nomination or supporting document (such as a letter of support), participating individuals grant the Arizona Center for Afterschool Excellence permission to use the any of the submitted materials, not protected by copyright, in advertisements and/or promotions without compensation or notification. Such advertisements or promotions may include internet/social media announcements of the Awards of Excellence or the conference, as well as print materials distributed at or in promotion of the events. Nomination deadline is April 15, 2019.